Pictured at the Pride of Place Awards ceremony are representatives from Blue Teapot Theatre Company, Galway along with the Lord Mayor of Belfast Alderman Brian Kingston, Dr Christopher Moran, chairman Co-operation Ireland and Tom Dowling, chairman of the Pride of Place Committee. 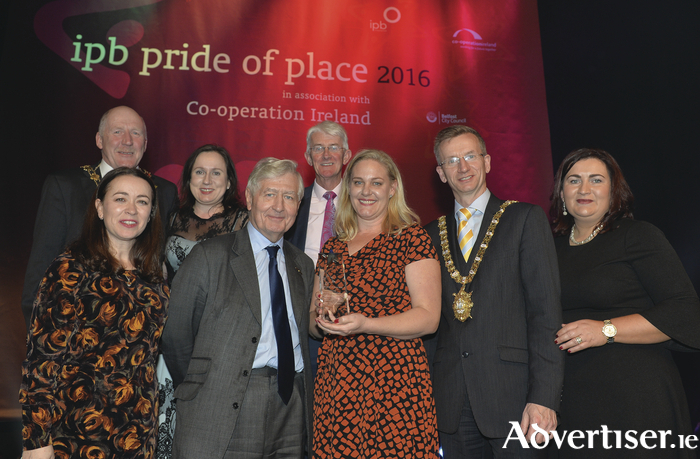 At the annual Pride of Place Awards Ceremony on Saturday last, three organisations from Galway picked up top awards - one in the main competition with another two in the cities competition. Clonbur Community Council took top place in category two of the main competition which is for neighbourhoods with a population of between 300 and 1,000 people. In the cities competition, Blue Teapot Theatre Company took top place in category six, which is the Community Arts Initiative category; and Saol Café, Galway took one of the Special Awards. On Clonbur Community Council, the judges said that “this Category Winning entry is characterised by a very majestic setting. Despite its small population, the local community has achieved many successes in recent years. The village has a thriving GAA Club and an active tidy towns committee. The youth are actively encouraged to participate in all activities of the community council such as the Zambia Youth Committee”. On the Blue Teapot Theatre Company, the judges said that visiting the winning entry community arts initiative was a heart-warming experience. They were provided with an outstanding performance by students with intellectual disabilities who showed great confidence and ability. The organization, managed by a small team of dedicated professionals, supported by a board of directors with a range of professional skills, and sustained by a three-year well-structured programme to develop performing arts skill, provides enormous opportunities for participants, particularly those with intellectual disabilities. Remarking on Saol Café the judges said “This community enterprise provides an essential environment which gives employability to people traditionally marginalised from employment opportunities, including people with disabilities. The judges were highly impressed by very professional and concise presentations. This is the first social enterprise café to exist on a higher education campus in Ireland”. Now in its 14th year, the all-island Pride of Place Awards promotes and celebrates the best in community development and recognises the selfless efforts of people in making their neighbourhoods better places to live, work and socialise. This year, a broad spectrum of groups were nominated, ranging from small rural communities to inner city housing estates. The Pride of Place Awards are divided into three awards sections – the main, the cities, and the special awards and during the evening a total of 53 awards were announced by TV personality Claire McCollum. The awards ceremony was hosted by Belfast City Council, with the Belfast School of Music, Streetwise Community Circus, Belfast Community Gospel Choir and The James Peak Experience providing the entertainment.